The Cuisinart CMW-100 microwave has a stainless steel interior and 25 preprogrammed settings. The ideal cooking environment, nonporous stainless steel, will not absorb odors, moisture or food particles. Pre-programmed one-touch controls guarantee that everything from reheating coffee, to defrosting cutlets, to cooking fish or making 2, 4, or 6 strips of crispy bacon will be done right. The CMW-100, a 1000-watt, 1.0-cubic-foot oven, lets you cook a meal from scratch, and make it a little healthier, without any oil or butter. In addition to its stainless steel interior, it also has stainless steel door and sleek control panel. The Microwave Oven has many exciting features for users of all types. You can extend the lifetime of your Microwave Oven with the purchase of a FactoryOutletStore Factory Protection Plan. 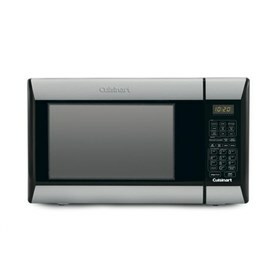 See the Microwave Oven product video above for more details. The Microwave Oven is sold as a Brand New Unopened Item.